This memory isn't one particular moment, but an annual tradition. I guess it started during my first year of working at The New PL. 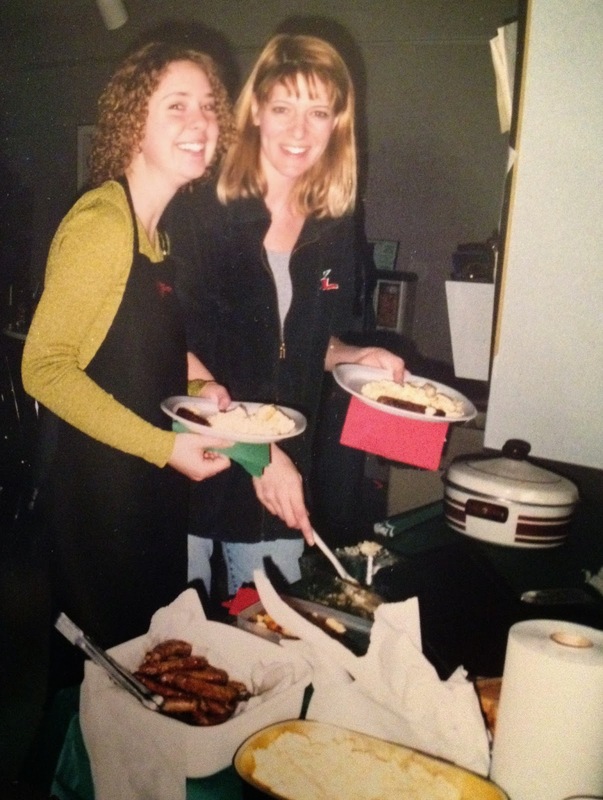 My friend Lisa and I were working on the morning show and decided to host a Christmas Eve breakfast potluck. It was AWESOME! We had our staff lounge buzzing with people. We cooked up bacon, sausages, eggs, pancakes... we even blew a fuse and had to move one of the cooking stations to the hall. It was a great morning and people just loved coming together on this special day. So, the potluck became a tradition. Over the years it morphed from breakfast to a full blown turkey dinner, with all the trimmings! As soon as the credits rolled, the newsroom was transformed to a family dinner table. We all settled into our roles - Jeff brought the ham, Jim did the potatoes, Scrappy made gravy and I always did the stuffing. Turkey duty rotated - depending on peoples' shifts. I'll always remember teasing Ross relentlessly when he brought buns & butter. He put the butter in the fridge when he got to work (so it wouldn't spoil) and we had rock hard butter at dinner that ripped the buns to shreds. Poor Ross. He took a lot of ribbing over that. The food was always great and the company even better.